Overshadowed by the hysteria that gripped the townspeople of Salem in 1692, Boston’s considerable witchcraft record has received relatively little attention. From the late 1630s to the 1690s, the town intermittently fell into witch-hunting fervor as accusations coalesced around individual women. (Men in Boston were seldom the subject of witchcraft accusations.) In all, four local women were convicted and executed in Boston witchcraft trials. Their stories – and the stories of other accusations that did not end in execution – reveal aspects of long-forgotten Boston history and the perils of life in a puritanical society that believed in the possibility of such events. While in prison she was visited by an imp the witnesses saw before it vanished into thin air. Any one of these circumstances, if believed, might have been sufficient to sway the court against her; taken together they formed a body of evidence Margaret Jones was unable to overcome. John Hale, later the author of A Modest Inquiry into the Nature of Witchcraft, was among Margaret’s visitors in jail shortly before her execution. He had a quite different explanation for the charges. Her case had come about, he alleged, because of “some angry words passing between her and her neighbors” and “some mischief” that befell the neighbors’ livestock. Looking forward to future posts! We spent a day doing touristy Halloween things in Salem last weekend, and before we went, I looked on my family tree to see if anyone had lived in Salem. I had a handful of people, so it wasn’t too hard to do a little more digging. To my surprise, Ann Foster is my 9th great grandmother…she was part of the 1691/92 hysteria. She confessed to being a witch, spent 21 weeks in jail and died in jail at age 75 before the trials were halted. Her daughter and granddaughter Mary Lacey also were accused and confessed and both freed when trials were halted. It has gotten me interested in reading more about the period and the theories behind the accusations. My 11th great grandmother was Winifred Holman (nee Henchman). 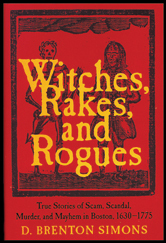 She and her daughter Mary Holman were accused of witchcraft in Cambridge in 1653. They were both acquitted, unlike another who was hanged at the time, and sued (partially successfully) for slander. Great post – As a descendant of both Rebecca Towne Nurse and of Martha Allen Carrier, I both appreciate and regret that my grandmothers were not alone in being victimized by this terrible hysteria. True too, is my appreciation that you have done such a great justice to all of these maligned folks by means of your good works, and in your remembering and telling of those days so dark. What people do not realize is that the witchcraft hysteria actually began in Danvers, Ma. and the foundation of the parsonage where it all began is there . The Rebecca Nurse House is also in Danvers . The city of Salem makes money from this . The Danvers Public Library has an archives which I believe has some or all of the original information from the trials . The hysteria began in Salem Village (present day Danvers),as opposed to Salem Town. The Rebecca Nurse Homestead is owned and operated by the Danvers Alarm List Company,an organization of militia reenactors. Jeffrey, as there are many of us related through Rebecca Towne Nurse, I just wanted to say “Hi” to a relative just found. I hope to some day be able to join our trees and be able to say that we first met here. It’s a sad historical fact about the witch hunts and the false accusations made against others by those who felt they were above the law and self righteous! So…hello to a new found cousin! Thank-you Nanette! Hello to you too, cousin.